A well fit cycling shoe is the foundation of comfort, performance and power to the pedal. A properly fit shoe should be snug in the heel with even pressure on the instep. You should not feel pressure against the ends of your feet. You should have toe room at the end of a well fit cycling shoe and the shoe should hold your forefoot stable without pinching or restricting. Shoes are important for a lot of riders as this can be a source of a lot of foot issues. Not having proper support in shoes will cause the arch of the foot to not function well and cause a loss of power and strength. We will properly fit your foot for width and length and work with bike shoe companies that allow us to order exactly what your foot would want. Have the professionals at Rocket Bikes measure your feet for proper length and width. We will guide you to the best fit shoe for your goals and needs. We work with companies that offer color choices, carbon, wide widths and even different size shoes for each foot. 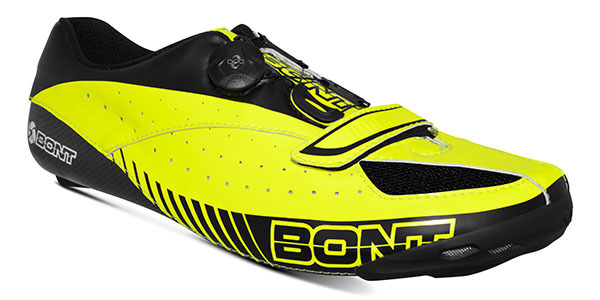 A few brands we work closely with are Bont Cycling, Fizik, Lake Cycling, Louis Garneau and Vittoria. Shoe fitting is free with purchase. Call or email us today to schedule. Offering carbon custom insoles has been a great asset for a lot of riders. We provide Sidas custom insoles which are molded in-house. The great part of these insoles is that we can mold them for you, send you off on a ride, and if you need tweaking we can toss them in our easy-bake-oven and remold! Cleats and pedals are the first contact point to be concerned about when fitting on a bike. This important base is where you will begin to build the best fit position for you. Cleat position on the shoe needs to be equal on both sides. If you do not have both cleats matching, you can create a lot of issues up the chain. For example, what if your left cleat is more rotated out then your right. This will cause your foot to be pointed in, which in turn will cause your femur to internally rotate, which in turn causes you to sit slightly forward on your left side with your pelvis on your saddle. This can cause such things as a tight iliotibial band (that pesky lateral band on your leg that attaches from the hip to your knee), overloaded quadricep muscles, over-tight hamstring, right upper hip pain, the list goes on. My goal is that your first base of support with your cleats will allow your body to be strong all the way up the muscular chain. As for pedals, we typically go to Shimano or Look. The base of support provided from these two pedal systems provides a strong support. The analogy I like to share is this. If you were to ride 100 miles on a pair of mountain bike cleats (small and built to get on / off your bike quickly) would be like riding on a pair of high heels. If you ride on a larger base, imagine your power platform increasing tremendously and creating a larger base of support. OR if you purchase cleats / pedals in house, we install for FREE!